Affordable Dentures - Anderson, P.C. 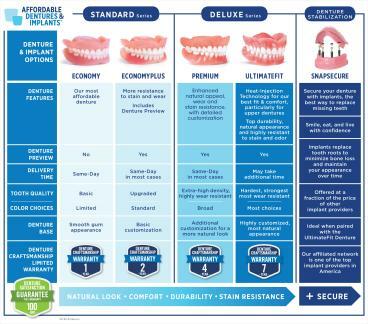 Anderson, South Carolina Affordable Dentures offers several styles of full dentures, each with special features and advantages. It’s part of our mission to put transformation within reach. See below for more details, or call us at 864-261-1889 if you have a question about a particular style. When you want compassionate dental care given with dignity and respect, let Affordable Dentures & Implants® in Anderson, SC serve you. We can offer you a full range of dentures so that you can have a smile that feels natural and look great. We’ll do everything possible to give you a good reason to smile. We can change your life in as little as one day. We only use proven, durable materials in our dental solutions, and we’ll be prepared to address any concerns you may have. We pay close attention to detail with every patient to ensure that we do things right. We’re part of America’s largest denture provider network, and we’re looking forward to assisting you. Dr. Jennifer E. Lohse earned her Doctor of Dental Medicine degree at University of Medicine and Dentistry of New Jersey. Based on many years of valuable dental experience, Dr. Lohse and her staff are proud to offer professional, compassionate care to patients that visit this practice. Please fill out the form below to request an appointment. For immediate assistance, please call us at 864-261-1889. These are minimal fees and charges may increase depending on the treatment required. All dentures are individually made for each patient. *Extraction pricing above is in conjunction with Full or Partial Dentures. Extractions needed without Dentures are priced differently. Please click on Fee Schedule tab at left to view a complete list of Extraction fees.